우리나라에 남아있는 가장 큰 종으로 상원사 동종(국보 제36호), 청주 운천동 출토 동종(보물 제1167호)과 더불어 우리나라에 남아있는 완형의 통일신라시대 범종 3구 중 하나이다. 높이 3.66m, 입지름 2.27m, 두께 11∼25㎝이며, 무게는 1997년 국립경주박물관에서 정밀측정한 결과 18.9톤으로 확인되었다. 신라 경덕왕이 아버지인 성덕왕의 공덕을 널리 알리기 위해 종을 만들려 했으나 뜻을 이루지 못하고, 그 뒤를 이어 혜공왕이 771년에 완성하여 성덕대왕신종이라고 불렀다. 이 종은 처음에 봉덕사에 달았다고 해서 봉덕사종이라고도 하며, 아기를 시주하여 넣었다는 설화로 인해 에밀레종이라고도 불리운다. 종의 맨 위에는 소리의 울림을 도와주는 음통(音筒)이 있는데, 이것은 우리나라 동종에서만 찾아볼 수 있는 독특한 구조이다. 종을 매다는 고리 역할을 하는 용뉴는 용머리 모양으로 조각되어 있다. 종 몸체에는 상하에 넓은 띠를 둘러 그 안에 꽃무늬를 새겨 넣었고, 종의 어깨 밑으로는 4곳에 연꽃 모양으로 돌출된 9개의 연꽃봉우리를 사각형의 연곽(蓮廓)이 둘러싸고 있다. 유곽 아래로 2쌍의 비천상이 있고, 그 사이에는 종을 치는 부분인 당좌가 연꽃 모양으로 마련되어 있으며, 몸체 앞,뒷면 두곳에는 종에 대한 내력이 새겨져 있다. 특히 종 입구 부분이 꽃모양으로 굴곡진 특이한 형태를 하고 있어 이 종의 특징이 되고있다. 통일신라 예술이 각 분야에 걸쳐 전성기를 이룰 때 만들어진 종으로 화려한 문양과 조각수법은 시대를 대표할 만하다. 또한, 몸통에 남아있는 1,000여자의 명문은 문장뿐 아니라 당시의 종교와 사상을 살펴 볼 수 있는 귀중한 금석문 자료로 평가된다. 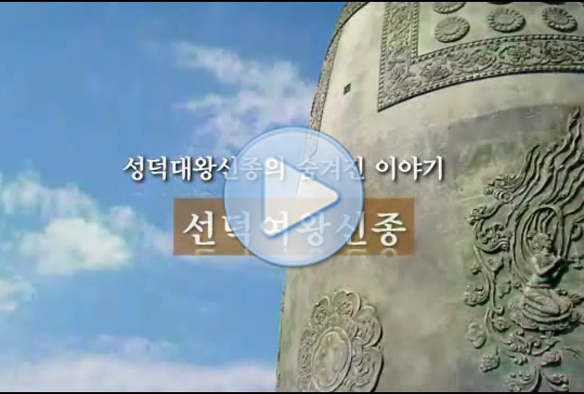 The Sacred Bell of Great King Seongdeok is the largest bell in Korea, measuring 3.75 m in height, 2.27 m in diameter (at the rim), and 11-25 cm in thickness (of the wall), and weighing about 25 tons. 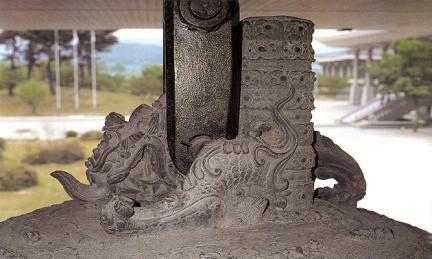 King Gyeongdeok of Silla commissioned the casting of the bell to honor the virtue of his father King Seongdeok, but he didn’t live to see its completion. It was eventually completed in 771, during the reign of King Hyegong, the son of King Gyeongdeok, and was named the Sacred Bell of King Seongdeok. 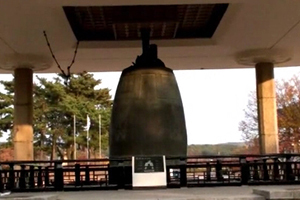 The bell is also known as the Bell of Bongdeoksa Temple, because it was hung at the temple at first; and as the Emille Bell, a name which derives from a legend that a baby was sacrificed to produce this bell. 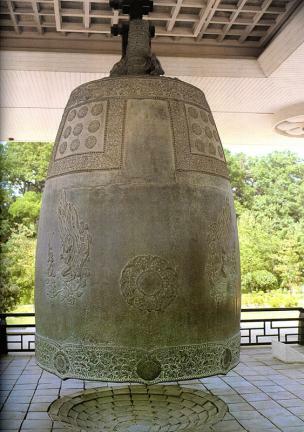 It has a hollow tube on top that is designed to control the tone - a unique feature of Korean bronze bells - and a hook carved in the shape of a dragon’s head next to the tube that was used for hanging the bell. 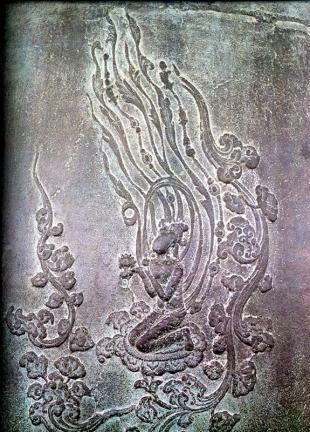 The bell is carved with a number of splendid patterns that represent the zenith of Silla art: There are two wide bands featuring flower patterns in relief around the bell’s mouth and shoulder, and below the shoulder bands there are four square blocks, each containing nine embossed designs in the shape of lotus flowers. Two pairs of Apsaras (Celestial Maiden) are cast in relief below the square blocks, and two striking points are raised in the shape of a lotus flower between the Apsaras. The bell’s mouth has several rhombic edges, showing a unique style. The bell also contains two inscriptions concerning its production. Consisting of about one thousand Chinese characters, they attest to the brilliant writing and carving style of the period, and have been well preserved for nearly 1300 years.